Book Drunk: Review ~ The Curvy Girls Club by Michele Gorman. Title: The Curvy Girls Club. The first thing that stood out for me in The Curvy Girls Club was the writing style, which I loved. Michele Gorman’s writing was smooth and very easy to read, which is why I found this book so engaging and finished it in less than a day. The writing was warm-hearted and covered a subject which is discussed a lot in society these days – weight and how your appearance takes impact on your life. 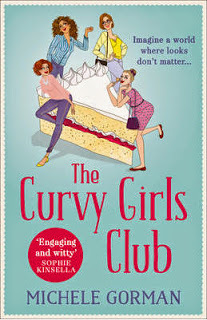 The novel revolves around Katie, Pixie, Ellie and Jane, four overweight women who bonded at Slimming Zone but then chose to create something a little less depressing and a lot more fun, The Curvy Girls Club. The author’s outlook on the theme of this book felt very realistic as a lot of the issues in self-esteem and self-confidence are very true to the way a lot of women feel. Having hang-ups about the way you look is not pleasant and so the idea for the friends to come up with a club to embrace who you are and just have a pure good time was hopeful and refreshing. However, I found elements of this story to be quite surprising and whilst that’s normally a good sign, I find myself with mixed feelings. I wish I had the attitude looks don't matter but I'm more obese than curvy. I'm looking forward to reading this. I like the sound of this book, being on the curvy side myself! Thanks for reviewing it. Have you read Swans Are Fat Too by Michelle Granas? I just finished it. It's a lovely contemporary tale set in Warsaw and also includes the message that looks and weight aren't the most important things in life.